Let me first say this – photography is at most 20% about the gear. There are photographers producing beautiful photos with everything from their iPhone to vintage large format gear. The other 80% is natural factors – the location, the subject, the knowledge, the experience, and of course the LIGHT. Knowing what gear to use when, and why, is critical in creating the images you want to create. This is what I use (or used) and why. Your style of photography, or experience, your personal preferences may differ, but this is what works for me – and why I think so. Check out my tutorials to get detailed information about how I selected gear to create some of my best and favorite images. I still shoot almost exclusively DSLR bodies. While many shooters have gone to mirrorless bodies from Sony, Nikon and Canon. I’ve had a compact mirrorless, but the ergonmics and Electronic View Finder just isn’t my taste. When I put the camera up to my eye, I want to see real light. Wildlife, Airshows, get a ‘feel’ for the light when shooting landscapes, I want to see the real thing, not the sensor’s version of it. I’ll lock the camera down on the tripod for landscapes and start using the LiveView rear screen, that’s close enough to an EVF for me at this time. Canon 5DmkIV full frame DSLR body – After several years of shooting almost exclusively with the 6D (see below) and carefully watching the specs and reviews of the 6DmkII, I made the decision to make my next body the 5DmkIV. The higher resolution, dual card slots, better weather sealing, and improved focus system for those times I’m not shooting landscapes was big parts of my decision. So why not a Sony and adapter? Mainly I wanted a very well-rounded camera that could do portraits, macros, anything I wanted to shoot. A Sony would have given me way higher resolution, but the pile of Canon class would have needed an adapter I wasn’t fully sold on. For the same reason I decided not to go with the high resolution 5DSR. 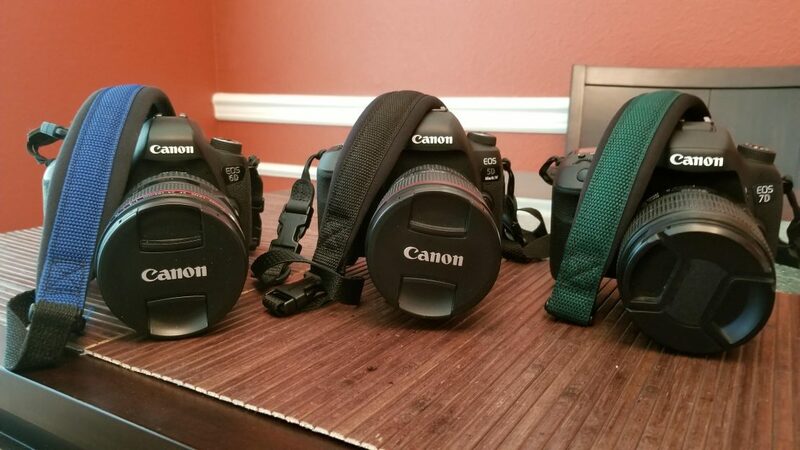 Canon 6D full frame DSLR body – I am primarily a nature and landscape photographer, the 6D which is lighter and slightly more compact than the 5D series fit my active style of shooting. Hiking miles through the woods or quickly moving along a shoreline with the sun quickly sinking into the horizon, it is easier for me to handle the 6D than the heavier bodies. While there are situations where I might be aided by the advanced focusing system and faster burst speeds, those are fairly few and far between. For the money, the 6D was my camera body of choice. As you probably just read, I’ve since upgraded to a 5D body, I do keep the 6D around for astrophotography, backup, and an occasional timelapse. I still believe that the 6D is one of the best all-around body for landscapes. The Sony alpha series might be smaller and more compact, but I personally dislike Electronic View Finders for when putting the camera up to the eye. Canon 7DmkII Professional APS-C body – picked up second hand, lightly used, the 7DmkII was part of my plans to diversify my shooting options a little bit in 2018, as I started to shoot a little more wildlife, some more airshows. What I didn’t consider was that the 7DmkII, when paired with a very fast telephoto lens and a good astro-tracker, it makes for an awesome deep sky astrophotography body (as DSLR’s go anyways). I’ve been keeping it attached to my Tamron 150-600 big telephoto lens as of late, though I have paired it with the 70-200 F4L for some night work. Canon EF 24-105L f/4 – this mid-range zoom lens came with the 6D. Decent all around lens, though I miss the little extra reach and the odd number aperture blades of my previous all-around lens on the crop body – the EF-S 15-85mm. Even with its shortcomings, it still provides a vital use in my kit. Be aware that many of the version-1 lenses developed extreme zoom creep when pointed up or down. Mine has done this, and Canon wanted several hundred dollars to fix. My solution was a whole lot cheaper – a wide rubber band from a bundle of asparagus. I keep a couple extra in the bag. Also makes it easy to see if I have this or the somewhat similar shaped 16-35F4L on the camera. Canon EF 16-35L f/4 – ultra wide lens for landscapes. Replacing the 17-40L as my ultra-wide lens of choice for landscapes it can also be pressed into service for Astrophotography, especially star trails when the F4 aperture gathers enough light in most situations. This is my primary landscape lens at present. Rokinon SP 14mm f/2.4 – When 16mm isn’t enough, when F4 isn’t enough, outcomes this specialty lens. This ultra-wide prime lens gathers a lot of light from a huge swatch of sky when astrophotography is the goal. Also makes for some very interesting landscape shots when there is an extremely strong foreground element in frame. The new ‘SP’ series from Rokinon is an entirely different sort of beast than the popular f/2.8 which this replaced. A very heavy and well built piece of glass. The price though, is several times what the f/2.8 version sells for. The worst thing you can do when using this ultra-wide lenses is standing up and shooting from 6ft above the scene. Just keep that in mind. Rokinon 14mm f/2.8 (SOLD) – When 16mm isn’t enough, when F4 isn’t enough, outcomes this specialty lens. This ultra-wide prime lens gathers a lot of light from a huge swatch of sky when astrophotography is the goal. Also makes for some very interesting landscape shots when there is an extremely strong foreground element in frame. Samyang 24mm f/1.4 – along with the 14mm, this is an essential piece of my astrophotography lens set. It has completely replaced the 28mm (below) as my go-to for night sky photography. Specifically corrected for coma and astigmatisms that plague many lenses from the major brands, Rokinon/Samyang have found the ideal formula for shooting the stars. Canon EF 28mm f/1.8 – I still like this lens, but it is no longer my go-to for night sky shots after coming to terms with its astigmatism problems in the edges of the frame. Stars turned into wide oval smears, and not because I was shooting too long of a shutter either. Now it’s kept around for some unique close up floral photography looks, and misc other Prime Lens fun. Canon EF 100mm f/2.8 Macro – the reason I will probably never go to Nikon, at least not completely. While I shoot mostly landscapes, Macro and close up work is a very close second and I LOVE this lens for that and so much more. Canon EF 50mm f/1.4 – For the very occasional portrait or when I need the low light / low depth of field. Doesn’t get used a lot, but wouldn’t consider selling it either. I recently tried it out on a Milky Way shot, and while I loved the frame-filling effect, this lens too suffers from quite strong coma in the corners as does many lenses not designed specifically to combat it. Not a problem that 95% of photographers face, so I can understand why it’s not made a higher priority to correct. Canon EF 70-200L f/4 – While the various f/2.8 options in this focal length are extremely popular, especially with the portrait crowd, I opted to buy the significantly less expensive and lighter weight f/4 version. With the primary goal of replacing the Tamron 70-300 with a higher quality lens for telephoto landscapes this was the best choice on the market. Tamron 150-600mm VC – the “Tamzooka”, this mega-sized, mega-telephoto lens is for reaching out and capturing wildlife at a safe distance. This lens was added to my kit at the beginning of 2016 and look forward to future visits to Hagerman National Wildlife Preserve and elsewhere to capture more living nature. Tamron 70-300mm VC – my telephoto zoom. I like it, but only out to about 270mm, and only stopped down a little. Know its limitations and it can produce some great shots, but it does have limitations. It has recently been largely replaced in my day-to-day kit by the 70-200L f/4. Sony a6300 (SOLD) compact mirrorless camera – recently purchased for ‘Travel’ (aka: vacation that’s not photography based) photography when the big Canon kit isn’t suitable to be brought along. Nice little camera, took a little getting used to Sony’s menu system and not having every control right at my finger tips as with the larger body Canon. I’ve since sold this camera. I simply wasn’t using it much, didn’t care for the EVF, and wasn’t pleased with a lot of the photos I was bringing home with it. I’ve been spoiled by my big gear, what can I say. One day I may give another compact mirrorless a try – but it’ll probably be a while, and likely not a Sony. Sony SELP1650 Zoom 16-50mm (SOLD) – the kit lens for the Sony a6300, a good lens with one fatal flaw for landscape photographers, the retracting barrel has some minor play in it, meaning in windy conditions and long exposure shots the front element can move some causing photo ruining shake. Still worth keeping around for on-the-go compactness. Sony SEL55210 Zoom 55-210 (SOLD) – a nice medium telephoto to pair with the 16-50 lens. Haven’t shot this a lot, but for the cost of a 10 day rental when I was headed to the UK, it was worthy it to buy a lightly used copy instead. Samyang 12mm f/2 (SOLD) – full manual lens like my full frame Samyang and Rokinon lenses, having this lens along was a saving grace when I realized that the lens barrel movement of the 16-50 was ruining many long exposure shots in England recently. Also gives the little Sony some astrophotography ability. slik 700dx pro tripod – picked this up primarily for timelapse, astro-tracking, storm chasing, anywhere that weight isn’t nearly as important as being sturdy and strong. I’ve paired it with the Benro ballhead that I pulled off the Induro when I upgraded that tripod’s ballhead. MeFoto GlobeTrotter Tripod (carbon fiber) – the ‘upgrade’ mentioned about the below RoadTrip, well this is it. And a good upgrade it is. The RoadTrip has been relegated to flash holder and loaner tripod duty. The GlobeTrotter is only slightly longer, and in carbon fiber only slightly heavier than the RoadTrip but quite a bit more stable. If I could only have one tripod, this might be it. Thankfully, no one is making me choose. MeFoto RoadTrip Tripod – good mid-range tripod for those who will want to carry it long distances but can’t quite afford carbon fiber. I’ll probably upgrade again sooner or later, but for now, it does its job as long as you don’t ask for long exposure shots in 20 mph winds with the legs fully extended. Canon Speedlight 430EX II – don’t use it much, but with the full frame not having a built-in flash, good to have on hand. Breakthrough X4 ND filters – after less than satisfactory results with some of my older ND filters I decided to give a new upstart company claiming the best and most neutral filters out there – and they delivered. Now a very happy owner of a 6 and 3 stop pair of Breakthrough X4 filters. Stacked they give better color results than the B+W 110, and on their own I can easily combine shots with and without the filters with virtually zero apparent color difference. I’ve also added their Circular Polarizer to the collection, keeping the below Marumi in the kit for a second lens or backup. Both are excellent options, but the big notches on the side of the Breakthrough filters make it far less likely for one to get stuck on a lens! Breakthrough Step-up rings – after having to get the filter wrenches out several times to get a filter that had gotten stuck on my set of cheap step up rings, I’ve invested in 2 rings that fit both sizes of my ‘less than 77mm’ lenses. Like their filters, the outer edge of these rings have big grippy notches that give plenty of grip for getting them off. The size-specific rings also are stronger with much less chance to distort when gripping them to remove. Marumi DHG Super Circular Polarizer CPL – best CPL for the money based on all the research I’d done. Would buy again if something happened to this one. B+W 110 10-stop ND filter – has some color cast, but gets the job done when a really dark filter is needed. May upgrade in the future, but only if I could get most of my money out of this one. OP/Tech Camera Straps (Envy and Pro) – A real quick shout-out for OP/TECH straps. The Envy is my daily strap with the ‘Pro’ strap system employed as part of my support system for the big Tamron telephoto lens. Canon Rebel XSi – the DSLR that got me started. Great little camera in good light, just don’t ask too much of its ISO capabilities. Which ultimately is what made me replace it. Canon 60D – my second DSLR. Bought just as the 70D was announced and the prices had dropped. Much more flexible in ISO capabilities than the XSi, and the flip out screen is a feature I’m still learning to do without on the 6D. Shooting low was so much easier when you didn’t have to get down with the camera to frame the shot. Canon EF-S 15-85mm – If I miss anything after the move to a full frame for Landscape work, it’s this lens. It’s the perfect walk-around landscape lens. Wide enough, plenty sharp stopped down, yet can reach out and shoot details at a moment’s notice. The 7 blade aperture making 14 point sun stars created some of my favorite sun rise shots ever. Still have it, but the auto-focus is messed up so until I either fix it or have it fixed, it’ll remain in limbo. Canon EF 17-40 L f/4 – ultra wide lens for landscapes. Replaced the 11-16mm Tokina I had for the 60D. Sunstars aren’t quite as nice, and miss the f/2.8 for the occasional shot of the Milky Way. With the introduction of the 16-35 F4 the sunstars are much improved, and the addition of IS makes 1/4 sec shutter speeds hand-held a real possibility. For me it was time to sell the 17-40 on. Thankfully most of the accessories I’ve bought along the way have been compatible with my new gear as I’ve moved up.